A hard day at work for John Kinne is when he suddenly has three minutes to save someone from irreversible brain damage at Fletcher Allen Health Care in Burlington. 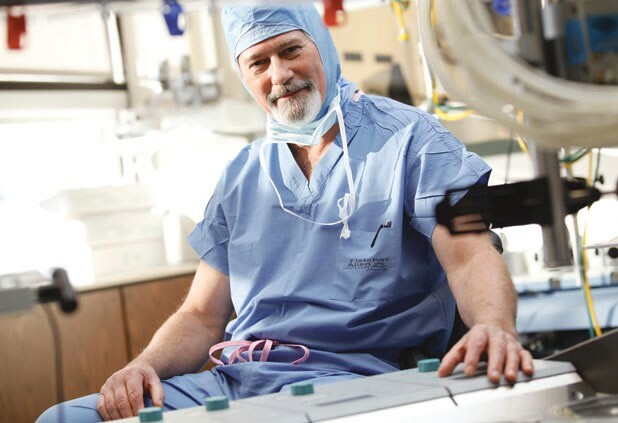 But Kinne, a 61-year-old New Jersey native who lives in Jericho Center, takes it in stride as one of Vermont’s three extracorporeal perfusionists. That’s a medical technician who operates the heart-lung machine, keeping patients’ blood oxygenated, and removing carbon dioxide while maintaining the necessary hypothermic body temperature, during bypass surgeries and other operations. Trained at SUNY Upstate Medical University in Syracuse, he’s had people’s lives in his hands — literally — for 26 years. Last week, in between operations, Kinne found a moment to sit down and chat with Seven Days. SEVEN DAYS: How’d you get from New Jersey to Vermont? JOHN KINNE: [After high school] I got out [to California] and worked as an auto mechanic for about a year and a half. I went to school for two years at Santa Barbara City College, then I transferred. I got my bachelor’s in biology from UC San Diego, and then I worked for the university hospital down there. Initially, I was a ward clerk in the emergency room, and then I got into the pulmonary lab. Then I met this guy in an elevator [a perfusionist] and started talking to him, and he said, “Yeah, come on in, take a look.” I figured I’d go in [to the operating room]. If I didn’t throw up, I’d give it a try. SD: What did you think when you saw what he did? JK: It was kind of a mind trip. I like physiology and, being an auto mechanic, I also like working with machines. It seemed to have a lot of the attributes of a good career that I’d still be interested in 20 years later. It’s fun. SD: Why is it fun? JK: It suits me. I like the challenge, I suppose. I like being able to think on my feet. There are only three perfusionists in the state, and nobody really knows [how to do] what we do. There’s nobody, really, you can depend on other than yourself. SD: So if you had a heart attack, the anesthesiologist couldn’t leap in and take over the machine? JK: No. Nobody knows it other than you. If you crap out, if you have a heart attack while [working], well, it’s — heh! —it wouldn’t be good. SD: How long does a typical case last? How long are you in the OR? JK: When you’re on bypass, they call that the pump run, the [patient’s] circulatory system is attached, so it’s all one circuit between the pump and the patient. That typically would be about, maybe, an hour and a half to two hours on a regular case. There aren’t real routine cases. You can’t assume anything. Not only can there be problems with the patients, anesthesia can have problems, [or] you can be on bypass and have malfunctions in the machine itself. Everything that can happen, I think, has happened to me. But that’s why you go to school. You learn how to deal with it. SD: Sounds like being a pilot. JK: They say the stress level is like [that of] an air-traffic controller. You have to trust your judgment when things come down. SD: What’s an example of something that could go wrong? JK: [Once] somebody walked by and accidentally hit the oxygenator. It was a fragile one and it broke off, and blood shot all the way across the room. In a situation like this, you have to shut the pump off to replace the oxygenator, but you have three minutes to do this before [the patient starts] getting permanent brain damage. This particular time, I held it with my finger [and] I got somebody to bring another oxygenator. That turned out all right. SD: Besides bypasses, what other kinds of surgeries are you involved in? JK: When I interviewed for school, [the interviewer] said, “You know, they’re doing angioplasties [the mechanical widening of an obstructed blood vessel] now. I’m not sure in five years they’ll even need us.” Well, as it turns out, they still did. All the angioplasty did was put things off for a little while. Patients [with tubes, called stents, to keep arteries open], they’re living a lot longer, and they end up having valvular disease. I’d say probably at least 50 percent of our cases now involve valves. SD: Do you love what you do? JK: It can be thrilling. Sometimes you get called in in the middle of the night. You show up, the patient’s already in the room [getting] chest compressions, and you’re not set up at all and you’re going, “Just give me a few minutes!” You better hope you did it right. There are a lot of little steps in setting up a pump. If you miss one, it can be catastrophic. But when those things work out, and they [have], so far, then you come off bypass and the patient has survived. Part of the intrigue about it is, when you’re working with these patients and have them on bypass and all this stuff is going on, and you’re manipulating their physiology … and of course you’re monitoring the [blood] pressures and all of that, you can kind of get a feel — are you a Star Trek fan? Spock? — it’s almost a mind meld with you and the patient.